Observation - Squirrel at rest - UK and Ireland. Description: This squirrel slept while I stomped around the woods, it only moved when seemingly being attacked by a Magpie. 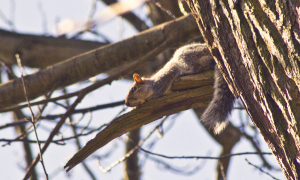 This squirrel slept while I stomped around the woods, it only moved when seemingly being attacked by a Magpie.